Axminster is situated in the extreme southeast corner of Devon on the River Axe whose catchment embraces the Rivers Kit, Yarty, Corry, Umborne and Coly. Between the valleys that these streams have sculpted, there are Upper Greensand ridges that dip gently to the south and to the sea. To the northwest of the town lies the Blackdown Hills Area of Outstanding Natural Beauty and to the south is the East Devon AONB. The landscape around Axminster is intimate and enclosed, as a result of low intensity livestock farming with small, irregular fields bounded by a network of hedgebanks. 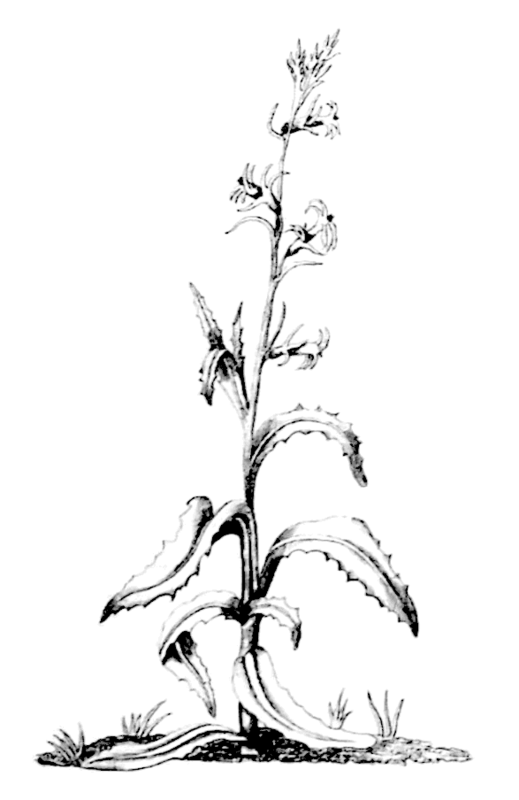 The Book of the Axe (1875) tells us that “among the vegetable productions of the district of the Axe there is an interesting range for the botanist … Especially has the Axe a reputation and glory of its own in the Lobelia urens, the only habitat of which in Great Britain is somewhere near Kilmington Hill”. Known at one time as ‘The Flower of the Axe’, the heath lobelia is still there, a rarity listed in the Red Data Book published by the Joint Nature Conservation Committee. Apart from Kilmington Hill and Shute Beacon, areas of remnant heathland are found on Trinity Hill Local Nature Reserve and on Lambert’s Castle, a Site of Special Scientific Interest that straddles the border with Dorset. Very little of the grassland is now ‘unimproved’, and the old hay meadows have largely been replaced by temporary rye-grass leys. But there remain a few unimproved neutral grasslands that support a rich mixture of species that include dyer’s greenweed, saw-wort, sneezewort, green-winged orchid, adder’s- tongue, ladies mantle and the wonderfully named corky-fruited water-dropwort. An outstanding example is the hay meadows at Goren Farm, Stockland that are ablaze with southern marsh-orchids in June and July when the owners run open weekends for visitors. North of Axminster, in Membury parish for instance, there are occasional outcrops of liassic limestone over which there are patches of calcareous grassland with locally uncommon species including yellow-wort, rockrose and pyramidal orchid. South of the town, there is coastal chalk plateau land with extensive areas of calcareous grassland as represented excellently by Goat Island and the Plateau that lie within the Axmouth-Lyme Regis Undercliffs National Nature Reserve, the undisputed jewel of the area. Natural England, which manages the reserve with help from the Axe Vale and District Conservation Society, run a programme of guided walks on the Undercliff. Ancient woodland developed on these calcareous soils is typically dominated by ash, associated with field maple and dog’s mercury in the field layer. Here are found rare species such as herb paris (its only Devon site is in woodland near Membury and Chardstock), goldilocks buttercup, toothwort, greater butterfly orchid and bird’s-nest orchid. The woodland on heavier, more acidic soils is dominated by pedunculate oak, often with hazel and holly amid bracken and brambles. These are our typical bluebell woods. Hedgebanks, which are corridors of woodland in an ecological sense, are the places to look for rarities such as green hellebore and orpine both of which are persistent escapes from earlier cultivation as a medicinal herb or use in local folklore. The Blackdown Hills have an extensive springline with bogs, wet scrubby woodland and alder carr which are sources of most of the tributaries that feed the River Axe. The River Kit, the most easterly, is probably also the most calcareous as indicated by the population of the rare alternate-leaved golden saxifrage on its banks in early spring. The Yarty, the longest tributary, supports the county stronghold of small teasel near Beckford Bridge, and wooded banks of the Umborne Brook have a possibly native site of monkshood, known here at least since 1948. In the lower Axe valley, East Devon District Council’s ambitious Axe Estuary Wetlands Project is acquiring land along the western bank to link the Local Nature Reserves of Seaton Marshes and Colyford Common, forming a 250 acre wetlands reserve. Black Hole Marsh has been acquired recently, and skilful water management is enhancing the interest of the site for wildlife, across an interesting salinity gradient. Here, botanical highlights include bulbous foxtail and beaked tasselweed.